Lawyers and legal researchers hate the process of Bluebooking citations. But it is one of the things that we must do. Good legal reasoning must be backed up with precise citations to source material. Like most Firefox extensions, installing Citegenie is simple–click on the download button on the CiteGenie website, permit it to be installed, restart Firefox, and accept the license agreement. You are then presented with the CiteGenie configuration screen. 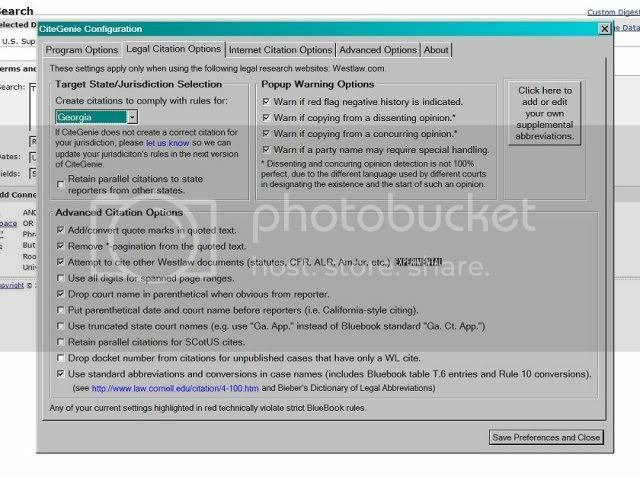 CiteGenie provides several options to comply with uncommon citation formats that may be required in your particular jurisdiction. One very useful feature is that any options you select that violate Bluebook rules will be highlighted in red to alert you that your choices are not in Bluebook compliance. The interface is easy to navigate and the options are all self explanatory. You can return to the CiteGenie configuration screen (added to the Firefox menu under Tools) at any time. After installation, “Copy with CiteGenie” appears as a menu option on the Firefox right-click menu just below the traditional “Copy” option. The “Copy with CiteGenie” menu option. 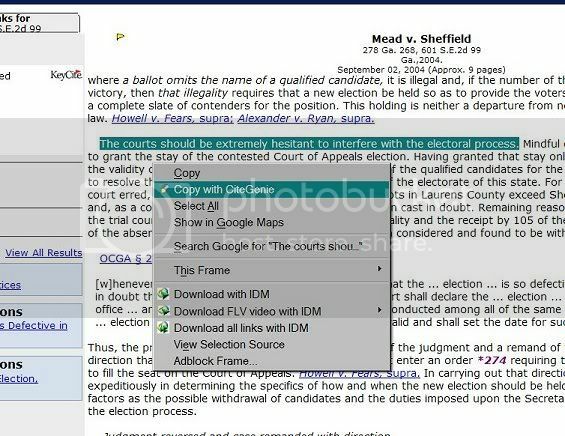 For CiteGenie to create correct citations for your jurisdiction, you must select the jurisdiction on the configuration screen whose rules you want your document to comply with. You select from a list that includes all of the states along with an option for federal courts. It also includes options to provide warnings for several events, such as if a case has negative history. For testing, all warnings were enabled to get a feel for everything the program can detect. All the appropriate options were also selected to be fully Bluebook compliant. “The courts should be extremely hesitant to interfere with the electoral process.” Mead v. Sheffield, 278 Ga. 268, 273, 601 S.E.2d 99, 102 (2004). “The courts should be extremely hesitant to interfere with the electoral process.” Mead v. Sheffield, 601 S.E.2d 99, 102 (Ga. 2004). CiteGenie apparently knows that for this case, when citing to a Georgia court, both the state and regional reporter should be cited, but when citing to a court outside of Georgia, only the regional reporter should be used. The court designation in the parenthetical is dropped in the first example since the state court name is obvious from the reporter. CiteGenie produced correct results when tested with a number of other random state court cases. Ga. Pub. Defender Standards Council v. Georgia, 644 S.E.2d 510 (Ga. Ct. App. 2007). Ga. Pub. Defender Standards Council v. State, 284 Ga. App. 660, 644 S.E.2d 510 (2007). CiteGenie correctly substitutes “Georgia” for “State” when the case is cited to a court outside of Georgia, as well as correctly using the “Ga.” abbreviation for the geographic modifier for the Georgia Public Defender Standards Council. Results were similar when tested with cases from a number of other court and jurisdiction combinations, including Pennsylvania (which uses “Commonwealth” instead of “State”) and California (which uses “People” instead of “State”). Each was cited correctly. “The judiciary is the final authority on issues of statutory construction and must reject administrative constructions which are contrary to clear congressional intent.” Chevron U.S.A., Inc. v. Natural Res. Def. Council, Inc., 467 U.S. 837, 843 n.9 (1984). Citegenie correctly abbreviated “Resources” and “Defense” in the title. It also italicized the case name, put quotes around the text, and added the comma between the name and citation. CiteGenie also made a correct parenthetical, the proper pinpoint page, and the footnote designation. Only U.S. Reports was cited, and parallel citations to the Supreme Court Reporter (“S. Ct.”) and Lawyers Edition (“L. Ed.”) were omitted. The Bluebook rule is very clear that when citing SCOTUS opinions, you should only cite to U.S. Reports and drop parallel citations. (For practitioners who want to retain parallel SCOTUS citations, CiteGenie has an option to “Retain parallel citations for SCotUS cites” which will do so.) After testing a number of other federal court opinions, CiteGenie produced a perfect Bluebook citation for each one. “Thus, this court concludes the defendant’s ‘identifying information’ is an advertisement under the TCPA.” Holtzman v. Turza, No. 08 C 2014, 2008 WL 2510182, at *3 (N.D. Ill. Jun. 19, 2008). CiteGenie correctly added the docket number before the electronic database citation per rule 18.1, and used the full date in the parenthetical. CiteGenie gave similarly correct results when tested on a number of other unpublished opinions in Westlaw. CiteGenie appears to use the same format for the docket number as is used in the caption of the opinion, so local practice may require editing to add dashes to, or remove spaces from, the docket number. CiteGenie also has an option on the configuration page to drop docket numbers from unpublished opinions if that is your local practice. Wis. Packing Co. v. Ind. Refrigerator Lines, Inc., 618 F.2d 441, 443 (7th Cir. 1980). CiteGenie got it right, including the proper abbreviations for the geographic designators in the party names. One or both party names may need special handling per Bluebook 10.2.1(i). Douds v. Local 294, Int’l Bhd. of Teamsters, Chauffeurs, Warehousemen and Helpers of Am., A.F. of L., 75 F. Supp. 414, 415 (N.D.N.Y. 1947). CiteGenie’s title for this case is too long. The Bluebook correct title would be “Douds v. Local 294, Int’l Bhd. of Teamsters” as the rule for union names (Rule 10.2.1(i)) is to drop all craft or industry designations after the first. Finally, I found a rule that, at least until a future version of CiteGenie comes out, requires human intelligence to implement. “Anyone who receives a prerecorded telemarketing call at home, without first consenting to the call, may sue and recover damages.” Charvat v. Ryan, 879 N.E.2d 765, 769 (Ohio 2007). “Anyone who receives a prerecorded telemarketing call at home, without first consenting to the call, may sue and recover damages.” Charvat v. Ryan, 116 Ohio St. 3d 394, 2007-Ohio-6833, 879 N.E.2d 765, at P11. I contacted an Ohio lawyer and asked about the second format. She referred me to Revisions to the Manual of Citations dated July 12, 2002 from the Ohio Supreme Court. (The Bluebook also references this document in table BT.1 on page 39.) Sure enough, for cases after 2002, under the Ohio manual, the official state reporter is first, the Ohio “webcite” is second (and mandatory), and the regional reporter is third (also mandatory). Since the webcite includes the year of the decision, and the official state reporter denotes a decision of the state supreme court, no parenthetical is needed. The Ohio format also employs paragraph numbers instead of page pinpoints, and CiteGenie provided those. Reading through the Charvat opinion, it became obvious that the court was using this Ohio-specific citation format. I clicked on the links to several of these cases cited in the Charvat opinion and tested CiteGenie on them, and it passed with flying colors. Even for SCOTUS cases, when cited for an Ohio brief, CiteGenie correctly relocates the parenthetical to the front of the citation per the Ohio rules. In fact, CiteGenie revealed that one of the cases cited by the Ohio Supreme Court in Charvat, was cited incorrectly. “(a) In each primary separate official ballots shall be prepared for the political party holding the primary.” O.C.G.A. § 21-2-284. “(a) In each primary separate official ballots shall be prepared for the political party holding the primary.” Ga. Code Ann. § 21-2-284. As with court citations, CiteGenie used the correct form of citation for each jurisdiction. Since citation rules change, a program like CiteGenie needs a dedicated development program. Looking at the CiteGenie changelog, the frequency of updates and new features being added shows that, unlike some Firefox extensions, CiteGenie is under active development. There is also a user forum for announcements and technical support. Munoz v. Orr, 200 F.3d 291 (5th Cir. 2000). but it will not tell you that certiorari was denied by 531 U.S. 812 (2000). You still have to update your case history yourself (“Shepardize” is the term we learned in law school, but for trademark purposes, Westlaw calls it KeyCite). Citegenie is very good. It is not quite perfect, but it does a better job than a lot of lawyers do on their own. And even if it is not better than you, it is undoubtedly faster. CiteGenie is not a substitute for knowing the Bluebook and your local jurisdiction’s citation rules. You still need to apply your own judgment to CiteGenie’s results. After using CiteGenie for a few days, I was hooked. I can’t imagine using Westlaw without it. 1. The CiteGenie website indicates that support for Lexis and other legal resources is in development.